It was great to welcome members of 'Team Green' to the 'works' Christmas Party. We enjoyed a splendid meal at La Brasserie restaurant in Wind Street, Swansea, followed by a little clubbing and dancing. Yes, I got the groom to the church on time! I turned from Secret Millionaire to Secret Chauffeur. 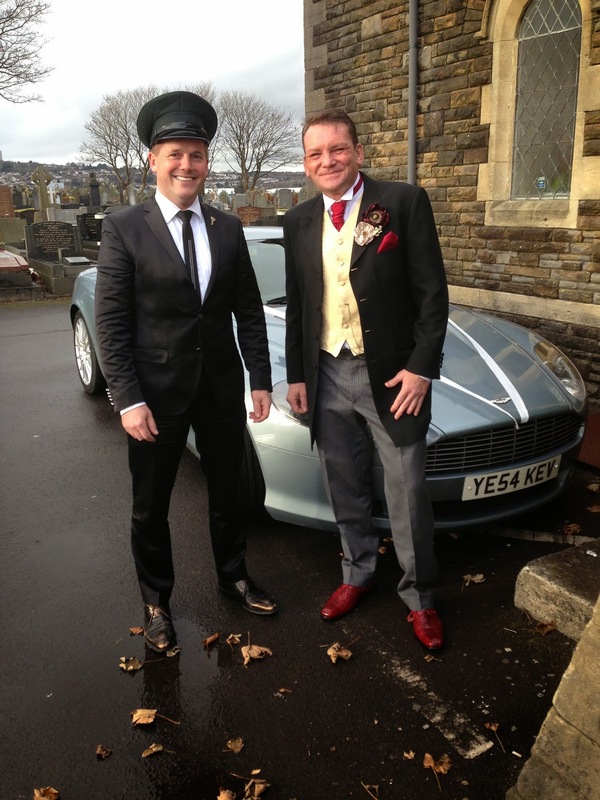 Secret Millionaire Kevin Green turned into the secret chauffeur to help make a wedding day dream come true. Mr Green, 50, donned a chauffeur’s hat and turned up in his cherished Aston Martin to help do the honours for Swansea couple Kevin and Wanda Harding. “As requests for help go, it was pretty unusual,” admitted Mr Green. “By all accounts, Wanda had been on the motorway when I overtook in my Aston Martin, which has a cherished number plate YE54 KEV (Yes for Kev). “There were only a few days to go before the wedding, but she thought it would be a wonderful surprise to ‘borrow’ the car to drive her new husband Kevin to church. “She tracked me down through a mutual friend and she was persuasive enough to convince me to hire myself out as chauffeur for the day. The couple were married at St. Samlet Church , Llansamlet, and will be making their future home at Kelvin Road, Clydach. The reception was held at Sketty Hall, Swansea, and the couple are honeymooning in Egypt. Kevin works at Tata Steel. Wanda works for Dor2Dor in Skewen. Mr Green, a Burry Port-based multi-millionaire and wealth coach who is also one of the UK’s largest private sector landlords, “It was such an unusual request, that I felt I had to oblige. Mr Green, who is also a Big Ideas Wales role model for young entrepreneurs, is accustomed to springing surprises. He sprang several during his time on the Channel 4 Secret Millionaire show. 'Team Green' will be in the big city of Swansea this evening. It's the annual 'works outing' for my team members. It's been the most successful year yet for 'Team Green'. The fun begins on Wind Street in Swansea later. There will be dinner, drinks and dancing . . . I'm putting on my chauffeur's hat today and doing my good deed for the day. I'm answering a distress call from a bride who's been unable to find her dream wedding car for her big day. So I am going to the rescue in my Aston Martin. Hope the dress isn't too big and that we'll be able to squeeze the bride in! Hopefully, I'll have some pictures later. The bride and groom are very kindly donating a fee for my services to the Make A Wish Foundation. The charity is, of course, very dear to my heart and I work as an ambassador for Make A Wish. Very busy evening at Parliament in Westminster. I'll post more about the occasion when I get time.